The point about being a member of a multi-academy trust is that the whole enables each of the schools to achieve more together than they could individually. Our approach is a mixture of collaborative convergence – for example in developing our maths and writing strategies in primary, where we have bought in SLE support, and central structures and systems in key areas: we are now all on SIMS; we have a single system for tracking progress in primary; our finance systems are consistent for consolidation and financial reporting to the Education and Skills Funding Agency; HR and Pay Policy is consulted on centrally with the unions, we have a single appraisal policy, and we run a centralised ICT service that ensures connectivity, security, quality and value for money. We are all partners in Manchester Nexus, our SCITT, and we all interview, train (and regularly appoint) trainees. The picture is constantly evolving. When new schools join, they bring their expertise to share. Where a school needs improvement, there is more central direction to build capacity and capability. We don’t want to restrict a school that is strong and making excellent provision for children and young people. Schools that have reached this point have substantial autonomy, and bring their experience and expertise to the table to help everyone improve. When key personnel in a school change (e.g. the Headteacher) the Trust will put in additional support and monitoring, including for strong schools, to ensure that the progress of the school continues through the transition. All our schools are developing Singapore Maths. Two primary and one secondary teacher are training with the North West 1 Maths Hub to become mastery leads and trainers themselves. One of our primary teachers is working across both primary settings to ensure consistency in developing Trust teachers, and in delivery. We are excited about our writing strategy, which has been developed with Heathfield Primary in Bolton. It is evidence-based and focuses on a progressive learning journey through English within each unit of work. Our primaries all use Target Tracker to track progress and inform teaching and learning. Targets are set centrally by the Trust for each child, based on their KS1 scores, and wherever possible building in ambition so that all pupils have the opportunity and challenge to achieve the best they can, and to become secondary-ready. Pupil data is monitored at school level, and at Trust level at termly data-drops. The Trust produces a data dashboard to summarise progress and attainment analysed for all groups across the year, a useful tool for schools and an invaluable visual summary for governance, enabling local committees to do their job of supporting and challenging school leadership effectively, without being buried in detail. All our schools have their own curriculum plan. As a Trust, we focus on ensuring that the topics and pedagogy are engaging, active, investigative and well resourced, so that teachers can focus on the learning and progress of the children in their class. The science curriculum has been developed through collaborative work across Key Stages 1 – 3 to develop scientific understanding, method, vocabulary and concepts, and ensure progression into KS3 work. We are now developing an assessment scheme and criteria to capture children’s learning and understanding. The Humanities curriculum has been developed through collaborative work across Key Stages 1 – 3 to enable pupils to learn about history and geography in investigative ways, enriching vocabulary and language, and exploring topics in depth. We have established a best practice model for Early Years, which has been quality-assured externally. All our Early Years settings use “Learning Book” as a tool for observations linked to the Early Years profile. We are a Church of England Trust that serves a multi-faith, multi-ethnic and multi-talented community. Our primaries work with our big secondary on an annual Faith Day, where pupils from both primary and secondary together explore the beliefs and practices of Christianity, Islam, Judaism, Hinduism and Sikhism. This respect for and understanding of faith is built into the Religious Studies curriculum. The Trust’s lay chaplain leads an interactive, exciting Christian assembly once every half term in each of our primaries, often involving students from the secondary, and always music, light, and activities. The enthusiasm of the children, whatever their faith background (or none) is always moving. All our schools support local, national and international charities however we can, particularly through Advent in December. CET Headteachers are developing a common primary behaviour strategy which looks towards developing a deeper understanding of the root cause of behaviour. We have built on the expertise of our leadership to develop strategies to embed good behaviour in our schools for all. 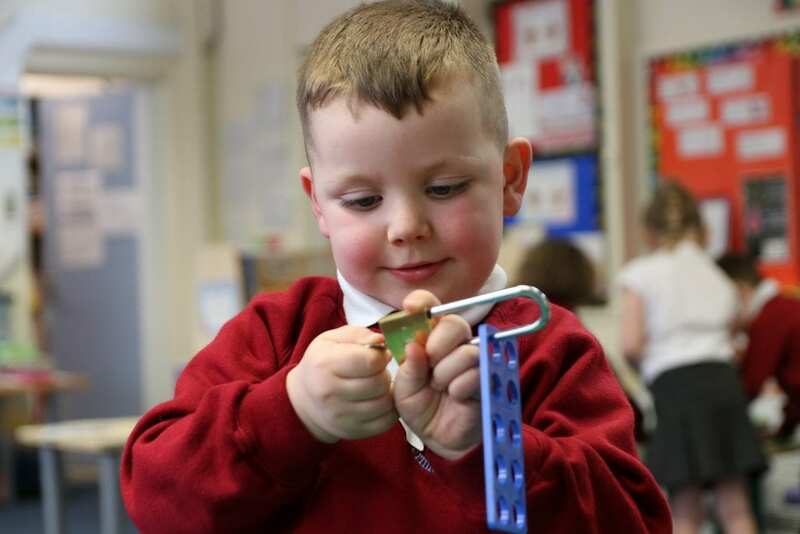 1.8 Collaborative Moderation of Key Stage 1, 2 and Early Years Foundation Stage across our Trust schools enables us to be certain that our judgements are secure and consistent. Embedding the improvements we’ve made, collaboratively. Pupil engagement and behaviours for learning. This is something we are working across primary and secondary phases, and particularly to support the progress and learning of our disadvantaged pupils. Developing the leadership of the whole-foundation curriculum across our schools. We use intelligent grouping to create an average class size of 26-27 in Key Stage 3 and 20-24 at GCSE. The Trust curriculum-led staffing model works on an overall contact ratio of 0.78 – 0.79 and a curriculum bonus (Years 7 – 11) of 11% – 12% which can be deployed by the school as necessary to meet a range of needs. Targets are set at school and pupil level by the Trust’s data analyst, working with the CEO and the Headteacher of the school. The targets are based on an ambition (and expectation) that all our schools will be in the top 40%, moving towards the top 20% for progress, whatever the starting point of the pupils. We are developing systems to evidence progress for all learners, including those for whom the steps may be smaller, but which are equally significant. We welcome schools who also want to develop this. We all use SIMS and SISRA. We have 3 data-drops per year and track progress in every school. We work on actual, not predictive data. The Trust’s data analysist provides metrics for leadership and governance to support monitoring and understanding progress. We have common assessment policies and moderate across schools to ensure robust and accurate data and feedback into teaching. We actively support the subject networks of the Teaching School Alliance. As a Trust we make a commitment/pledge to all our students that we will help them develop as whole people, both through the curriculum and care and nurture of their school, and through a range of opportunities which enables everyone to engage, to learn something different, to be creative, to become involved in their community, to develop as a leader, a team worker, and a person who is proud of the contribution they can make. We are a Church of England Trust that serves a multi-faith, multi-ethnic and multi-talented community. The Trust’s lay chaplain supports schools for worship and assemblies. The CET provides training and support for teachers of Religious Studies in all our schools. We all support local, national and international charities however we can, particularly through Advent in December. We are developing a common behaviour policy across the Trust to which all schools contribute. A common behaviour policy and consistent strategies, with the opportunity where possible to use the scale of the Trust to support pupil placements and managed moves. We welcome schools who want to help develop/lead on this. The Cranmer Education Trust has a nationally accredited School Centred Initial Teacher Training arm, Manchester Nexus, which is now recruiting and training over 50 primary and secondary trainees per year. This is our pipeline, which gives our Headteachers direct access to some of the best and most motivated people coming into teaching. They train in our schools and in our wider Teaching School Alliance because they want to work in our area, and they have bought into the moral purpose. All our schools take part in the selection of trainees, and host trainees for both their main and contrasting placements. Opportunities to become Initial Teacher Education trainees and Newly Qualified Teacher mentors. Opportunities to be seconded to another Trust school to achieve breadth of experience. Development through our Teaching School Alliance networks. The opportunity to become Specialist Leaders of Education leading school-to-school support. Look at some of our staff stories for further detail. School improvement capability depends crucially on leadership capacity. Leaders in our Trust have the ambition to drive excellence for the benefit of all our community. 3.3.1 All our teachers lead. The Trust’s role is to train, support and coach them in developing the necessary skills and behaviours. As teachers progress through the pay spine there is an increasing expectation/requirement that they will have an impact at whole-school level. This could be in leading curriculum, subject or pedagogical development; developing the mentoring and coaching skills to take responsibility for an Initial Teacher Training trainee or a Newly Qualified Teacher; leading and organising enrichment for pupils; working cross-phase; supporting other schools in the Trust to gain leadership experience/development. 3.3.2 National Professional Qualifications are offered to all our teachers, as part of career planning, through our partnership with Ambition School Leadership. NPQ Middle Leaders and NPQ Senior Leaders are run by a consortium of Teaching School Alliances led by Blue Coat, Oldham Sixth Form College and Harmony Trust. Within our Teaching School Alliance we have a pre-NPQ provision for Aspiring Leaders, offered to teachers who are progressing through the mainscale and looking to develop leadership skills. Our staff are encouraged to become accredited as Specialist Leaders of Education who lead Initial Teacher Education, CPD, Networks and School-to-School Support. The purpose of the Trust is to enable Heads and their staff to build excellent provision for their children and young people. To enable Heads to do this, the Trust has a strong central infrastructure to support schools. The Finance Manager works with Headteachers to set their budget to achieve the priorities of the school and the commitment of the Trust to excellence, ambition and community. All schools use the same financial software to ensure we can consolidate reporting to the Education and Skills Funding Agency. Training is provided and staff with financial responsibility fully supported. Budgets are monitored locally and centrally. Local committees receive the budget, the budget outturn, and a monitoring report mid-year, to enable members to support and challenge school leadership. The Financial Regulation manual and Scheme of Delegation specify the financial responsibility limits at Trust, school and individual level. The Trust is one organisation, and a single employer of all the staff in the schools. All HR policy is consulted on; the Trust has a Trade Union Recognition Agreement and meets at least twice a year with local and regional union representatives in a Joint Consultative and Negotiation Committee. Terms and Conditions – All teachers are appointed on Burgundy Book Terms and Conditions. All support staff are appointed on Green Book and National Joint Council terms and conditions. The Trust wants to be an employer of choice and always implements national pay awards. HR Systems – The Trust has a single system for Pay Policy for teachers and teacher appraisal, and a separate single system for support staff appraisal. Staff management within each school is the responsibility of the Headteacher. The Headteacher is accountable to the Chief Executive Officer (CEO). The Trust’s Principal HR officer liaises weekly with Headteachers and advises on all staffing issues, liaising with unions as necessary. Workforce Development – Ensuring that we have the right people in the right place doing the job that is needed, being supported and developed professionally to do that job, and being valued and recognised for their work is the responsibility of the Operations Director, working with the Principal HR Officer. The Operations Director liaises closely with Headteachers to ensure that the organisation runs effectively and efficiently. The Operations Director appraises the support staff lead in each school on behalf of the Trust, working with the Headteacher to ensure the school’s needs, in its context, are the priority. All our schools are electronically connected via a Trust Wide Area Network (WAN). IT is managed remotely from the Help Desk with regular school visits. When schools come into the Trust, we evaluate their network, connectivity, security and devices and work with the school to upgrade a necessary. 4.3.2 All Trust schools benefit from the expertise of the central ICT Helpdesk who are very quick to respond to any issues reported via the ticketing system or via the telephone. School systems are being monitored continuously with the highest standards of web filtering giving confidence to Headteachers that pupil safety on-line is the best it can be. Equipment is ordered centrally ensuring compatibility and value-for-money. The rolling programme of updating resources means that there are opportunities for primary schools with proportionately smaller budgets to obtain IT resources from secondary school which they otherwise might not have afforded. 4.3.3 Staff and pupils can access school resources remotely bringing a range of benefits. The ability to share resources via a trust wide secure network equally supports curriculum improvements and mutual collaboration across the Trust. Every school has a Business Manager or Site Manager who is responsible for ensuring that the school is clean, safe and well-maintained. All school budgets include an allocation for repairs and maintenance. Strategic estates development, major refurbishment, or renewal/expansion projects, are managed at Trust level. Our aim is always to anticipate and plan by overseeing the maintenance plan and regular structural and service checks. Currently the size of the Trust means that we have to apply to the Conditions Improvement Fund for major works. As we grow, that funding will be delegated to the Trust, which will enable us to plan strategically. Our Data Analyst sets targets with schools, creates dashboards for local and trust governance, provides a detailed analysis of national data, and training for senior staff. The Trust buys in centrally for every school to services such as insurance, legal, payroll, audit, software for IT licenses, finance software, Data Protection Officer. Other contracts remain school-specific determined by local need. There are a wide range of policies set at Trust level which cover all schools. These are maintained and updated in line with current legislation by the Trust. E.g. finance policies, data protection, safeguarding, health and safety. Schools set their own policies to cover localised needs and requirements e.g. admissions, attendance. provide administrative support for communications with parents, reprographics, HR processes (staff absence monitoring and returns, recruitment admin etc). How this is configured will depend on the size of the school and its context. 5.1 The Trust Board – Within a Multi-Academy Trust, the responsibility for governance lies with the Trust Board. Directors are appointed by the Members (ie the ‘owners’ of the Trust). The Trust Board has to lead the Trust strategically, as one organisation, ensuring its financial probity and sustainability, the overall quality of its educational provision, and its compliance within the law. It is important that this Trust Board is separate from local governance of schools (except in specific situations where, for example, the Trust Board needs to step in to take responsibility for an individual school that is experiencing difficulties, or the particular skillset of a local governor will inform the Trust Board). The Trustees delegate particular roles and responsibilities through a Scheme of Delegation. 5.2 The Chief Executive (CEO) – The Trust Board appoints the CEO actually to run the Trust, supported by an executive team, including finance, operations, HR, ICT and data analysis. Schools within the Trust have their own Headteacher, or Head of School, who is accountable to the CEO for the quality of the school and its provision for children. 5.3 Local Committees (i.e., local governance) – Schools also have a local committee of governors, whose role is to provide support and challenge for school leadership, ensure that the essential independent panel responsibilities are fulfilled, and to provide that essential link between the school and the wider community that it serves. Full details are set out in the Scheme of Delegation, but essentially local committees have responsibility in the areas set out below. Where necessary (eg for panel work), one of the benefits of being in a Trust is that local governors can provide the informed independence for another Trust School. 5.3.1 Oversee and quality assure educational standards – They receive a fuller data dashboard than the Trust Board, so they can see not only where the school is making progress overall, but how that affects groups within the school – boys and girls; disadvantaged pupils; children with Special Educational Needs and Disabilities (SEND); the progress and achievement of pupils from their individual starting points; the progress and achievement of pupils for whom English is an additional language. This enables governors to ask strategic questions, without being buried in detail. The designated governor (normally the Chair) works with the Headteacher to ensure that recruitment procedures are in line with those outlined in ‘Keeping Children Safe in Education in 2018’ and to review the Single Central Register at least termly. 5.3.3 Named governors take responsibility for overseeing provision for SEND pupils, disadvantaged pupils, pupils in the care of the Local Authority. Trust officers will support the named governor. 5.3.4 Ensure the robust and consistent application of the Trust’s Appraisal and Pay Policy for teachers. 2 nominated governors scrutinize a cross-section of anonymised appraisal reviews. 5.3.5 Quality assure attendance and exclusion, again to be able to question school leadership about trends and policy. 5.3.6 Receive the budget, a monitoring report, and the budget outturn. This enables the local committee to understand how the school uses its resources and, if necessary, challenge. The operation of the budget is the responsibility of school and Trust staff. In these areas, governors are fully advised by the CET’s HR lead and, where necessary by our legal services. 5.3.8 Represent the school in its community to support a positive reputation for the school, which benefits the young people. In particular, the Trust Board encourages local committees to reach out to employers and support the careers work of the school, so that children and young people have a sense of wider world in which they can, and will, play a part. In the broadest sense, it is our job to ensure all our children are employable and eager to enter the world of work, and achieve the purpose, satisfaction and dignity that that brings. 5.3.9 Quality assure statutory checks/Health and Safety. A named governor checks the statutory checks with the Business Manager/Site Manager, and reports to the committee. S/he would also normally walk the site every term to discuss maintenance and repairs, which are then fed into the Trust Executive. 5.3.10 Admissions – Where a school is oversubscribed and criteria other than distance/sibling link have to be applied, a small committee of local governors is responsible for administering this process. Admission appeals are managed by school leadership. 5.3.11 Complaints – The CET has a single Complaints Policy. If a complaint cannot be resolved at Headteacher, or Chair of Local Committee level, then Academies law requires establishment of a panel with an Independent Chair, plus 2 other governors who have not been involved in the matter. 5.4.1 Local Committees can be any size, but should not be smaller than 7 and ideally not larger than 11. (See below). Each local committee must have 2 elected parent governors, and 1 elected staff governor. The remaining members of the committee are appointed by the Trust Board. 5.4.2 On joining the Trust, where the school is a faith school, appointment of Foundation governors is in conjunction with the Diocesan Board of Education and the school’s Foundation. 5.4.3 Where the school was a community school, (or single Academy Trust), the CEO normally works with the Chair of the Legacy Governing Body to make the appointments on behalf of the Trust Board. The Headteacher is a member of the local committee by virtue of their post (ie., ex-officio) and is appointed by the Trust Board. The Trust/Foundation appointed members of the local committee are always in the majority. Where the school has a Foundation which makes appointments, the Trust Board will always appoint at least one further governor, in addition to the Headteacher. 5.5 Terms of Office – All local committee governors are appointed for 4 years. Appointments may be reviewed after that. 5.6 Protocols for governors visiting their school – To be able to fulfil their role, governors should visit their school and see it in action. However, this has to be managed sensitively and in the right way, through the Headteacher. Governors are there to learn, not to inspect. Feedback must be shared with the Headteacher first. The Trust has a protocol for governors visiting their school. If there are concerns that a governor is not able to access the school, this should be referred to the CEO. The Trust uses the National Governors’ Association’s (NGA) Code of Conduct. All governors are expected to abide by this, and the Nolan principles of good conduct in public service. Governors are expected to access training, whether provided by the Trust Executive, or through the online training provided by the NGA, which the Trust buys for all governors. The Trust does an annual skills audit, where governors are asked to evidence how they have developed their knowledge and skills as governors by accessing the training.